Mike is 47 and lives in Newport, South Wales. 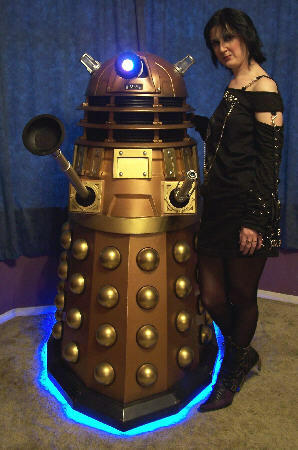 He is married to, and is the carer of, the lovely Eleanor, and over 2005/2006, he built 'Rosco P. Dalek'. 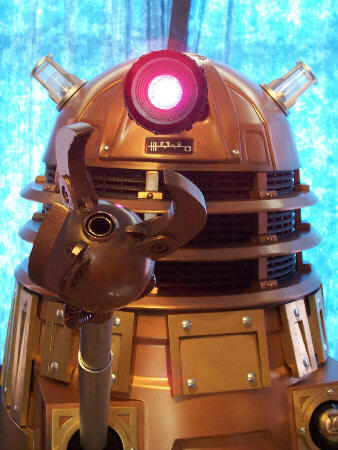 Rosco is an NSD, ('New Series Dalek') based on the lone Dalek that appeared in 'Dalek' in 2005. 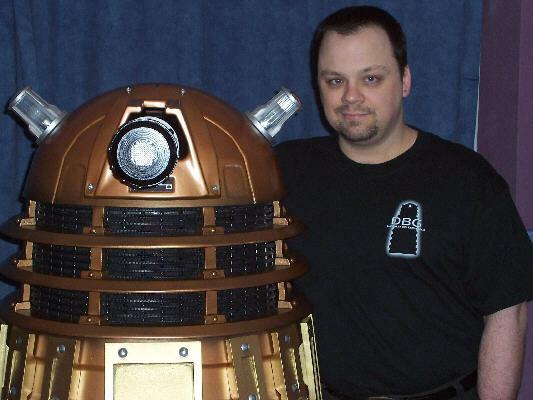 Rosco was one of the earliest examples of a fan-built NSD to be completed, and was built with the support and encouragement of The Dalek Builders Guild, and it's friendly rival site, Project Dalek. Rosco is entirely full sized and is built mainly from various thicknesses of MDF. Starting from the top, his 'ears' flash in time with his speech, which is powered by an internal 12volt voice modulator system; the actual ear lenses are the same as those used on the 'real' Dalek props. 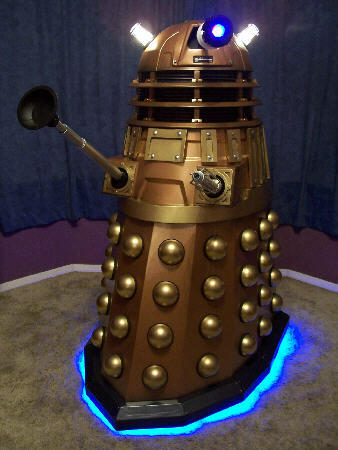 His dome is made from thermoformed plastic, and the rotation is manually controlled from inside the Dalek. The eye features colour-changing LED illumination that constantly cycles through blue, blue/green, green, red/green, red, etc. Rosco's neck features the same rubber industrial floor matting that was used on the original BBC NSD prop, which is generally known as 'MT1', after effects wizard Mike Tucker. 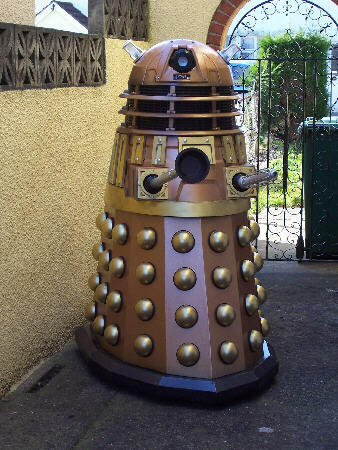 The shoulder section was one of the hardest parts to create from wood; the shape is far more complicated than that of a 'standard' Dalek, and the surrounding slats are much more complicated in design also. Rosco can have either the usual 'plunger' or an assault claw fitted to his arm! 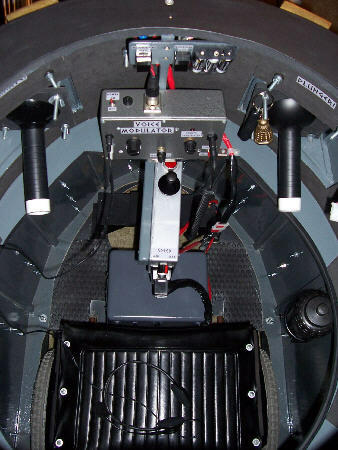 Rosco is powered by 24 volt electric wheelchair motors, with a small control joystick mounted 'fighter pilot' style inside the skirt section. The motors drive two large rear wheels with pneumatic tyres, the front wheel being a single large central castor. The base illuminates from beneath to replicate the 'elevate' effect with ten 12 volt blue cold cathode 'neon' tubes. To enter Rosco, the dome lifts away, then followed by the neck, and the shoulders hinge open to one side to allow the operator to squeeze in sideways through the resultant gap. The shoulders are then closed again, and an assisstant places first the neck and then the dome back into place, with the operator connecting the wiring loom up along the way. The shoulder hinges have removable pins, so the shoulders can also be fully removed, along with the skirt being removable from the base, for the transport of all the sections/and passage through small doorways etc. All of the pictures on this page are the property of Mike Bull and may not be used or reproduced in any way without his explicit written consent.